The author offers a re-appraisal of this period and an analysis of the disagreements between historians. Civil century, war, regicide, republic, the Cromwellian protectorates, the restoration of monarchy: some of the most exciting and dramatic events in English history took place between 1640 and 1660. Gerald Aylmer conveys the massive and continuing psychological and emotional impact of those times, and offers an up-to-date analyisis of the causes, significance, and consequences of what happened. 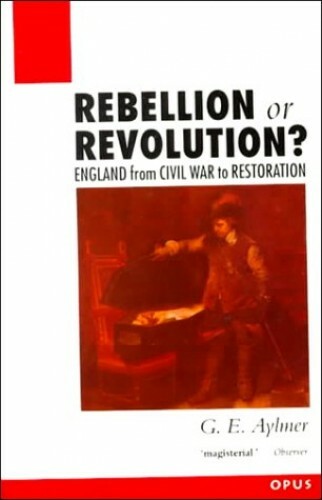 The period was dominated by such powerful personalities as Charles I, John Hampdon, John Pym, Oliver Cromwell, and John Lilburne; but Dr Aylmer, also attempts to discover the views of the anonymous mass of the population who lived through the political and religious upheavals of the mid-seventeenth century. This book is intended for general readers interested in the mid-seventeenth century and those interested in the OPUS series. Students from A-level upwards studying English history, the seventeenth century, the Civil War, the Restoration.